Exchange between Abu Abdullah and Abd al-Rahim Atoun. 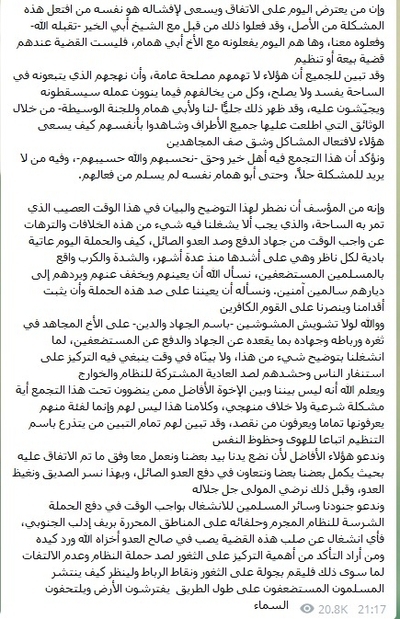 This post features a statement by Hay'at Tahrir al-Sham's Abu Malek al-Shami and a response by Abu Humam al-Shami (aka al-Faruq al-Shami), who used to be the general military official for Jabhat al-Nusra. For more information on Abu Malek al-Shami, see this post. It is Abu Humam al-Shami's statement that is of greater interest. Reports that he was killed in March 2015 turned out to be erroneous, but there was some biographical information provided about him at the time that he partially affirms in his statement. According to Orient News, he travelled to Afghanistan in the late 1990s and gave allegiance to Osama bin Laden, but after the U.S. invasion of Afghanistan, he was entrusted with operations in Iraq a little before Baghdad fell in 2003. During his time there, he supposedly met both Abu Hamza al-Muhajir and Abu Mus'ab al-Zarqawi. The Iraqis then arrested him and turned him over to the Syrian authorities, who released him. But following a 2005 crackdown on jihadists by the Syrians, he fled to Lebanon, then returned to Afghanistan and was entrusted by Atiyat Allah al-Libi to operate in Syria. Detained in Lebanon for 5 years, on his release he joined the budding al-Qaeda wing in Syria, becoming Jabhat al-Nusra's general military official. - The discussion of the possibility of replicating a Hezbollah model in Syria. His point is not that the Sunni jihadist project should become a client of Iran, but rather that there is little prospect of securing something viable along the lines of a 'state within a state,' as Hezbollah's status in Lebanon is widely characterized. In any case, he argues that the model for the Sunni jihad should not be Hezbollah, but rather the Prophet's example. I have heard speculation inside Syria (though not from within Hay'at Tahrir al-Sham itself) that Hay'at Tahrir al-Sham may be aiming for a jihadist 'state within a state'-type project through the cover of the Turkish intervention in northwest Syria securing the supposed 'de-escalation' zone centred on Idlib. That is, the Turks might help to bring a more regularized security and governance structure to the area, but Hay'at Tahrir al-Sham would become a key part of that system and in parallel to it. That interpretation might help explain the Hay'at Tahrir al-Sham coordination with Turkey over surrounding Afrin. More generally, as a former key member of Jabhat al-Nusra and then Jabhat Fatah al-Sham still inside Syria put it to me, "The Turks and the commission [Hay'at Tahrir al-Sham] are agreed on one policy in the region." Indeed, there is no real sign of a Turkish confrontation of Hay'at Tahrir al-Sham in the way it fought the Islamic State in north Aleppo countryside to create the Euphrates Shield Zone, contrary to some hopes before the Turks entered into the northwest. - Abu Humam al-Shami has little confidence that Russia and Iran will actually adhere to the 'de-escalation' concept as agreed for Idlib. Right now a number of forces and militias have mobilized for the Syrian government's push against the insurgents in the Hama and Aleppo countrysides, beginning to push into Idlib, while the Islamic State is also putting pressure on Hay'at Tahrir al-Sham in the area. It is reasonable to note that more forces will likely be deployed once the eastern campaign is finished and the East Ghouta pocket is dealt with. - Meetings with Hay'at Tahrir al-Sham to try to resolve differences, but impeded by the organization's arrest of Dr. Sami al-Oraidi and others (though as of the time of writing this post, Oraidi was released from jail four days ago). - The advice Abu Humam al-Shami offered to Abu Malek al-Shami on fighting Islamic State in west Qalamoun. Abu Humam al-Shami's point on Abu Malek al-Shami's reluctance to fight Islamic State in the area is corroborated by evidence from the time. Whereas Jabhat al-Nusra joined with other Syrian rebels in most areas in fighting the Islamic State at the turn of 2014, west Qalamoun was a notable localized exception for some time. For instance, note this part of an apparent 'Jabhat al-Nusra in Qalamoun' statement in January 2014 that disavowed infighting: "Jabhat al-Nusra and the Islamic State in Iraq and al-Sham are on one manhaj even if politics differ." - The claim that a large proportion of Hay'at Tahrir al-Sham's fighters remain with the group on the basis that there is still a secret allegiance to al-Qaeda as their amirs convinced them that the breaking of ties was only a media cover. Below are the texts of both statements with translation. All explanatory notes of my own are in square brackets. God blessed the believers when He opened for them a door from the doors of jihad in the blessed land of al-Sham, and mobilized men for it who bore the banner with honesty and blessed them with conquests. Then God- Exalted is He- willed that the field should pass through great fitnas in which many of the believers are tested. The jihad movement was able and for the first time in the contemporary history of jihad to move to a movement that lives through the pains and sufferings of the people, and exerts efforts to convey the zeal of supporting the religion to the Muslim masses, and the success of this particular move clearly appeared in the land of al-Sham and praise be to God. From the outset, our allegiance was to the Qaedat al-Jihad organization as we knew that this group was only ever interested in supporting the religion of God according to the Book of God and the Sunnah of His Messenger (SAWS), and this is what we heard and read from most of the leaders and mashaykh of the organization, and when the Ahl al-Hall wa al-'Aqd in al-Sham considered that the interest of the jihad requires that no name of the organization should appear, coinciding with the directives of Dr. Ayman (may God protect him) in a number of interviews that we should place our loyalty to the religion and not the organization, and his words on breaking ties with the organization to realize bringing together the Muslims' power in al-Sham. The move from Jabhat al-Nusra to Jabhat Fatah al-Sham was within that which does not contravene the principles of our hanif religion, for our loyalty is to God's religion and our love for this organization is dependent on its obedience of the guidance of our Prophet, upon whom be the best prayers and most complete salutations. 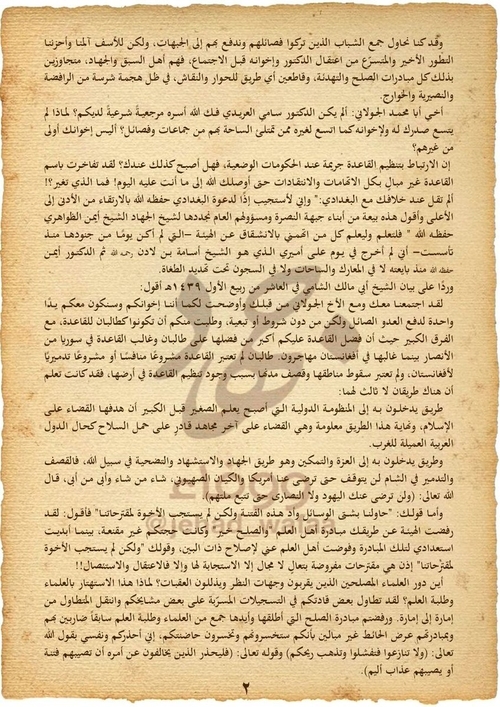 And after that the circle of jihad broadened for the project of Hay'at Tahrir al-Sham was in the coming together of most of the factions under this group, and here there was a true breaking of ties with the organization, but the group did not break its tie with the manhaj of the Ahl al-Sunn, for it is still implementing and will continue to implement by God's permission the rule of God's law and this is what cannot be bartered, for our blood and souls are in sacrifice to support this religion. And what happened today is the product of a past stage, in which we have tried by different means to put out this fitna but the brothers did not respond to our suggestions, and the one who considers the interest of the field and the interest of the Ahl al-Sunna in al-Sham knows that the calamity is great, so we will work striving to extinguish this fitna if God wills. Oh God, make the outcome of our affair easy and grant our mashayakh success in what is best and successful for Your servants. I call on my mujahideen brothers in all factions- leaders and soldiers- to cling to God the Exalted's rope, and adopt the covenant of implementing the ruling of the hanif law, and translate it into steps on the ground in which we bring together the ranks of the mujahideen far removed from factionalist apportionments and quarrels. The suffering is not abandoning from my Ummah: until it disappears, it [the Ummah] is separated and ruined. My mujahideen brothers. Our enemies here have gathered on their falsehood striving to benefit from our separation, and striving to light the fire of fitna and disagreement, for we are distracted away from fighting them as one rank, despite the fact that what brings us together from the brotherhood of religion and creed is greater and larger than what separates us. And the Sunnah of God is not partial to anyone, so let our aim always be to realize the highest interest even if it is realized at the hand of the one who disagrees with us from our brothers ('and do not quarrel, for you will fail and your strength will vanish, so be patient. Indeed God is with the patient'). I- the poor servant- mobilized to jihad before knowing the brother Abu Muhammad al-Jowlani, for I gave allegiance to Sheikh Osama bin Laden- may God have mercy on him- by the handshake, so I bore on my neck the allegiance to the Qaedat al-Jihad organization that remained steadfast on its manhaj that the years and tribulations did not alter. 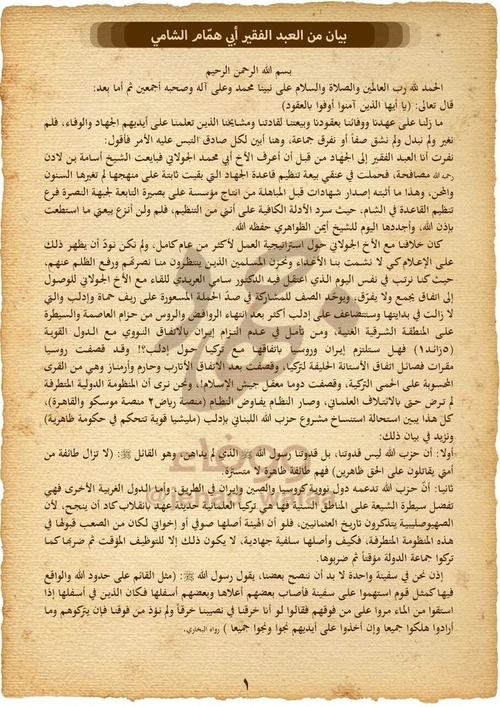 And this is what the issuing of witness testimonies before the mubahala established from the production of al-Basira foundation affiliated with Jabhat al-Nusra, the branch of the al-Qaeda organization in al-Sham, whereby it presented sufficient lines of evidence that I am from the organization. So I have not and will not do away with my allegiance as far as I can by God's permission, and I renew it today to Sheikh Ayman al-Zawahiri (may God protect him). 1. Hezbollah is not our model, but rather our model is the Messenger of God (SAWS), who did not deceive when he (SAWS) said: 'A sect from my Ummah will continue fighting on Truth and overcome.' So they are a sect that overcomes, not concealed. 2. Hezbollah is supported by nuclear states like Russia, China and Iran on the path. As for other western states, they prefer the Shi'a to control the Sunni areas, for here is secularist Turkey, which recently faced a coup that almost succeeded- because the Zio-Crusaders remember the history of the Ottomans. Even if the commission's [Hay'at Tahrir al-Sham's] origin were Sufi or Ikhwani it would be difficult to accept it in this extremist system, so how will it be accepeted if its origin is Salafi jihadi? That will only be for being made use of temporarily, then to strike it just as they left alone the Dawla group temporarily then struck it. So we are in one boat where we must advise each other. The Messenger of God (SAWS) says: 'The similitude of the one observing God's hudud and the one transgressing them is as a people who have boarded a ship by lot, for some of them have gone on the upper deck and some on the lower deck. And when those on the lower deck require water, they go to those above them and say: 'If we were to make a hole in the bottom of our ship, we would not harm those above us.' But if they let them do as they wish, they will all be destroyed, but if they stop them, they will all be safe'- narrated by Bukhari. We had been trying to bring together the youth who abandoned their factions and encourage them to go to the fronts, but regrettably the recent and hasty developments from the arrest of the doctor [Sami al-Oradi] and his brothers before the meeting pained us and saddened us, for they are the people of precedence and jihad, thus overstepping all initiatives of conciliation and calming tensions, and cutting off any means for dialogue and discussion, in the shade of a fierce attack from the Rafidites, Nusayris, and Khawarij [Islamic State, which has an enclave in Hama countryside]. Brother Abu Muhammad al-Jowlani: wasn't Dr. Sami al-Oraidi- may God free him- a legitimate source of authority among you? Why has your heart not opened up to him and his brothers just as it opened up to others besides him from those the field is filled with from groups and factions? Are not your brothers closer than those besides them? The tie with the al-Qaeda organization is a crime among the governments of man-made laws, so has it likewise become so with you? You were proud of the al-Qaeda name, not caring for all the accusations and criticisms, until God brought you to what you are on today! So what is it that has changed?! Did you not say on your disagreement with Baghdadi: 'I thus respond to the call of Baghdadi- may God protect him- by referral from lower to higher, and I say this is an allegiance from the sons of Jabhat al-Nusra and their general official that we renew to the sheikh of jihad, Sheikh Ayman al-Zawahiri, may God protect him.' So may you know and may all who accused me of defecting from the commission (among whose soldiers I have not been for a day since its establishment) know that I never rebelled against my amir who was Sheikh Osama bin Laden- may God have mercy him- and is then Dr. Ayman (may God protect him) since the time I gave allegiance to him, neither in the battles nor fields, and not in the prisons under the threat of the tyrants. The path by which they enter the international system that has come to be known for certain as being aimed at destroying Islam, and the end of this path is well-known and it is to destroy every last mujahid capable of bearing arms as is the condition of the Arab states that collaborate with the West. As for your words: 'We tried by different means to put out this fitna but the brothers did not respond to our suggestions.' I say: the commission rejected through you the initiative of the Ahl al-'Ilm ('And conciliation is best') and your pretext was unconvincing, while I demonstrated my readiness for that initiative and I authorized the Ahl al-'Ilm on my behalf to make amends. And your words: 'But the brothers did not respond to our suggestions.' Yes, when they are pre-imposed suggestions to come down with no space except to respond affirmatively to them, otherwise arrest and being wipedout!! As for your words in the statement rejecting the conciliation: 'We also wish from all to go forth and raise readiness to resist the campaign the Nusayris and Rafidites are launching in the countrysides of Aleppo and Hama.' I say: you put a stranglehold on us when we received the points of ribat, and you prevented the Turkistani brothers [Uyghurs of Turkestan Islamic Party] from helping us, and you prevented any attempt to put in order our union, and despite that we encouraged our youth to go to ribat as individuals without showing forth our name, and we did not accept at the time from any mujahid that he should defect from the commission or take away arms from it while filling a front. So we wish that you do not engage in point scoring against us, for it is well known about the al-Qaeda organization that it is a people for fighting, jihad, support and heeding the call, for al-Qaeda was the precursor to mobilize to support the oppressed Muslims in Afghanistan whose language was a hindrance for us and whose cold tore apart our limbs, so what of the people of al-Sham who are our people and our brothers in kinship?! Indeed a large proportion of the commission's soldiers are still with you on the basis that you are secretly affiliated with al-Qaeda, so on the breaking of your ties, your amirs convinced their soldiers that it is just a media cover and that the allegiance remains secretly, but after the recent developments your mistakes and wrong-doing against your brothers became clear to all, so hurry to correct the mistake before the situation becomes critical and gets out of your control, and thus you lose what you gained and you fall from grace in the eyes of the mujahideen. And I say to you oh Sheikh Abu Malek: you acted very slowly in fighting Baghdadi's organization in west Qalamoun despite the advice and directives I sent you, saying that they would betray you when they had the chance, and this is what happened! But you had a view to delaying confrontation with them. Some excused you while others accused you of being Da'esh [Islamic State]. Why have you not endured us with the tenth of your endurance for the Dawla organization? For your endurance of us will not go in vain, for the manhaj of the al-Qaeda organization is well known to all: a people of fulfilment and support, not a people of treachery. And we will be together in all difficulties that will face us especially if your experiment in the national salvation government fails or a political ally betrays you! Make great the law you claim affiliation with and let this law be the ruling and judge between us and you. Even if the opposing party were from among the just, it has not been permitted for him to be the judge by the consensus of the Muslims, for how was it that God Almighty said in Surat Yusuf: 'I do not acquit myself. Indeed the soul enjoins evil except on those my Lord has mercy. Indeed my Lord is forgiving, merciful.' So if the path of the majority of 'ulama is not to permit that the judge dispense justice by his own knowledge lest there be bad thought in him and the door be opened to judges of evil, so how is it allowed for the judge to be the opposing party? As for the campaign of arrests against our brothers and cadres, it will not prevent us from continuing our jihad against the enemies of God, and it will open upon you a door you will wish that you did not knock, and we continue to be prepared to sit and work with our brothers in the commission, but there must be release of the brothers and restoration of rights to its owners as the first steps of the path, for it is not reasonable that we should sit for conciliation and the best of our brothers are arrested and powerless. Friday 13 Rabi' al-Awal 1439 AH. The second statement from the poor servant Abu Humam al-Shami. Praise be to God who says: "And what is the matter with you that you do not fight for God and the oppressed from the men, women and children who say: Our Lord, get us out from this village. The oppressor is its people. By Your grace, grant us a helper and protector." 1. We affirm the obligation to fight and prepare in God's path, and not to allow sitting away from repelling the criminal aggressor's attacks, and we support what came in the statement for distribution by Hay'at Tahrir al-Sham about forbidding sitting away from fighting. The Almighty has said: "And I do not wish to contravene you in what I forbid you from." 2. We thank and commend those heroic men- may God give them victory and protect them- whether they are from the brothers in Hay'at Tahrir al-Sham or those who suspended work with them or others besides them from the factions who are now resisting the hateful aggression in the countrysides of Hama and Aleppo, for this blessed al-Sham will only be Islamic and a graveyard for the aggressors God willing. 3. We clarify regarding the arms through which jihad is waged by the members and groups affiliated with the commission [HTS] or those who have suspended their organizational works with it: the matters remains as it is. Each side preserves the weapons in its possession through which it wages jihad against the aggressor. The Almighty has said: "The disbelievers have wished that you should neglect your arms and baggage in order to swoop on you in one attack." And that is so until the Ahl al-'Ilm, those of the initiative 'And conciliation is best' rule on the matter, and we urge our 'ulama to hurry to clarify and resolve this issue. The Almighty has said: "If you quarrel in something, refer it back to God and the Messenger, if you believe in God and the Last Day. That is better and better in result." 4. We remind of the sacrosanctity of blood, and we take refuge in God from the malicious joy of the enemies, and we urge for the obligation of the 'ulama, and we remind the mujahideen that they are on a great front. So God forbid that we should be preoccupied with partisan disputes, or that Islam should be attacked by them. The poor servant Abu Humam al-Shami. 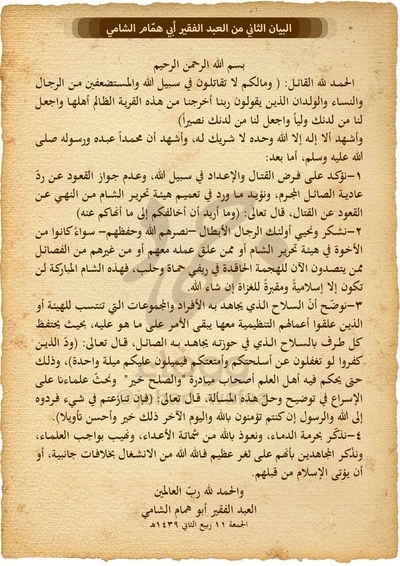 "Seeking to prevent bloodshed of the mujahideen and desiring to protect the interest of the field of al-Shami, I- the poor servant- agreed with the brother Abu Muhammad al-Jowlani on a number of points: my brothers from students of 'Ilm reviewed them and found in them some Shari'i notices, so I decided to refer them to the Ahl al-'Ilm in the committee of 'And conciliation is best' that was mutually agreed on, in order to rule on them by Shari'i judgement. And I urge my mujahideen brothers to be patient, man the fronts and be preoccupied with resisting the aggressor enemy. For it is the obligation of the time. 21 Rabi' al-Thani 1439 AH." The two parties have a choice so long as they have not separated. The Messenger of God (SAWS) said: "The two parties have a choice so long as they have not separated. Or he said: until they should separate, for if they have been honest and clear, may they be blessed in their transaction, but if they have concealed and lied, the blessing of their transaction is destroyed. "- muttafiq alayhi. Before the beginning of the meetings with the mediating committee to resolve the disagreement between us and the party of the brothers who have chosen to come under the command of the brother Abu Humam al-Souri, we made it a condition that they send a delegate from their side so that we could reach an earnest agreement binding for both sides, so they sent Sheikh Abu Huma al-Souri who mentioned that he was their delegate, and in the beginning of the meetings some of the details concerning authorization of delegation remained but they were resolved in the fourth session by confirmation of authorization of delegation, and one of the eminent ones from the mashaykh of the initiative "And conciliation is best" tried to mediate, for they informed him that the brother Abu Humam was the delegate from their side, as one of the members of the initiative "And conciliation is best" transmitted to us- which increased our sureness of the matter of authorization of delegation, as it is the basis on which the agreement was made in the presence of the head of the "And conciliation is best" initiative and some of its members and the brother Abu Humam and a member of his Shura council. And we tried- we and the brother Abu Humam- by different means to make the agreement successful, and each of us offered concessions to unite ranks, mend the break, put the union in order, and direct our interests entirely towards the imminent danger in the region and resist the recent campaign of the criminal regime. And after the conclusion of the agreement session, and all the parties signing it, we were surprised by the other side's demand to modify 16 clauses out of the original 16 clauses from the clauses of the agreement: i.e. cancel the agreement entirely! And the brother Abu Humam mentioned that he embraced the agreement but could not implement it because most of his group did not accept, so what is the value of authorization of delegation then! And in all circumstances, this is an internal problem among them that is not our problem. As for our side, we are bound by the agreement and we embrace it, and we proceed on its basis by God's permission by requirement of signing and witnesses. Their refusal to testify for him puts them in the same place that they claimed we had fallen into. On that basis they had strongly condemned us and provoked all these problems because of it, despite the fact that we took permission from the deputy amir because of his absence- as is well known- but as for them, they authorized delegation to their amir, and he brought about an agreement, then they clearly and unequivocally refused to testify for him. The one who opposes the agreement today and is trying to make it fail is the same one who provoked this problem originally, and they did that before with the Sheikh Abu al-Khayr- may God accept him- and they have done it with us, and they are today doing it with the brother Abu Humam, so the issue with them is not an issue of allegiance or organization. And it has become clear to all that these people are not concerned with general interest, and the direction they follow in the field is one that sows corruption and is not just, and all who disagree with them in what they intend to do, they bring them down and muster against them, and that has clearly appeared to us and Abu Humam and the mediating committee through the documents that all the parties reviewed, and they have witnessed themselves how these people are striving to incite problems and split the ranks of the mujahideen. And we affirm that in this gathering are people of good and truth- as we reckon them and God is their reckoner- and in it are those who do not want the problem to be resolved, and even Abu Humam himself has not been safe from their deeds. It is regrettable that we have been compelled to issue this clarification and statement in this difficult time that the field is passing through, in which nothing from these disagreements and farces must distract us from the obligation of the time of defensive jihad and resisting the aggressor enemy. This is all the more so as the campaign today is brazen and obvious to every observer and is at its most intense point since a number of months, and the intensity and fear are befalling the oppressed Muslims. We ask God to help them to resist this campaign, make firm our feet and give us victory over the disbelieving people. And by God, were it not for the distortion of the distorters- in the name of jihad and religion- against the mujahid brother on his front and ribat and jihad through what holds him back from jihad and defending the oppressed, we would not have been preoccupied with clarifying anything from this, nor would we have clarified it at a time when we must focus on calling on and mobilizing the people to resist the joint aggression of the regime and khawarij. And God knows that there is no Shari'i problem or manhaj disagreement between us and the gracious brothers who come together under this grouping, and these words of ours are not for them but a group from them they know perfectly well and they know who we mean, and it has become completely clear to them who in the name of the organization is invoking following of whims and chances of life. And we call on these gracious people to put our hands together and work together according to what was agreed in complementary fashion and we cooperate to repel the aggressor enemy, and thus we make the friend joyful and enrage the enemy, and before that we please the Lord, Almighty and Exalted is He. And we call on our soldiers and the rest of the Muslims to be preoccupied with the obligation of the time in repelling the fierce campaign of the criminal regime and its allies against the liberated areas in south Idlib countryside, for any preoccupation away from the crux of this issue serves the enemy's interest- may God bring them to ruin and turn their schemes on them. And whoso wishes to be sure of the importance of focusing on the fronts to resist the campaign of the regime and not paying attention to anything besides that, let him go on a tour of the fronts and points of ribat and see how the oppressed Muslims are spread along the road, lying down on the ground and wrapped with the sky in this terrible cold. And their hopes- after entrusting their affairs to God- have been pinned on the mujahideen youth of the Ahl al-Sunna. So embrace your fronts. May God have mercy on you. Fulfil your jihad, make your intentions pure. May God place you and thank your jihad, ribat and steadfastness. "And do not despair or be said, you are the most supreme if you are believers." "Oh you who believe, be patient, endure, keep to your ribat and fear God. Perhaps you will be successful."